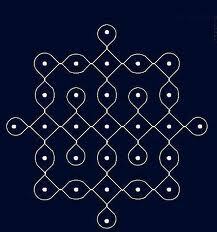 7 - 1 parallel dots (Neer Pulli) Kolam - Start with 7 dots in the centre. Leave one dot at both ends and put 2 lines. Leave two dots at both ends and stop at 1 - one line by putting parallel dots at both sides. Thanks for posting beginner kolams. The step by step instructions is very helpful. Would it be possible to deconstruct your previous kolams, in a stepwise manner ? I don't know if this is too much of an effort. It it is, you can ignore my suggestion. Thank you for your suggestion. Main purpose of this site is to pass on the traditional art to future generation. Hence nothing is too much to keep this art alive. I will make all kolams step by step so that younger generation will learn this art. Thank you for your reply.I do appreciate your efforts. I live in the USA, and keeping this art alive is one of my secret ambitions too.